From the beginning of Jon's career, he's had the opportunity to work on several deals from resales to new development projects, making him knowledgeable of the process of structuring a building from start to finish. His experience in real estate has allowed him to meet so many unique individuals with different goals, providing him exceptional instincts to help clients make quality decisions. His upbeat personality, listening and interpersonal skills all help clients meet their real estate goals, whether it be with a first time buyer or an active seller. Jon is a native New Yorker, who received a Bachelor of Science degree in International Business and Finance from Quinnipiac University. 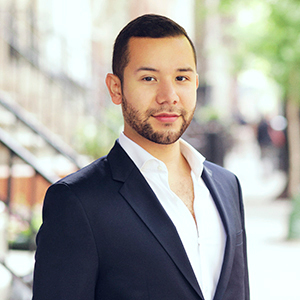 His ability to speak Spanish fluently, unique personality and interest in other cultures have impacted him positively in this diverse city, and his financial background only boosts his knowledge in providing comprehensive recommendations for investments in real estate. Having a tremendous appreciation for architecture, interior design, art and reading, Jon devotes his time to his interests when not serving his clients. His love for the city allows him to experience new adventures daily, keeping his life full of enjoyment.